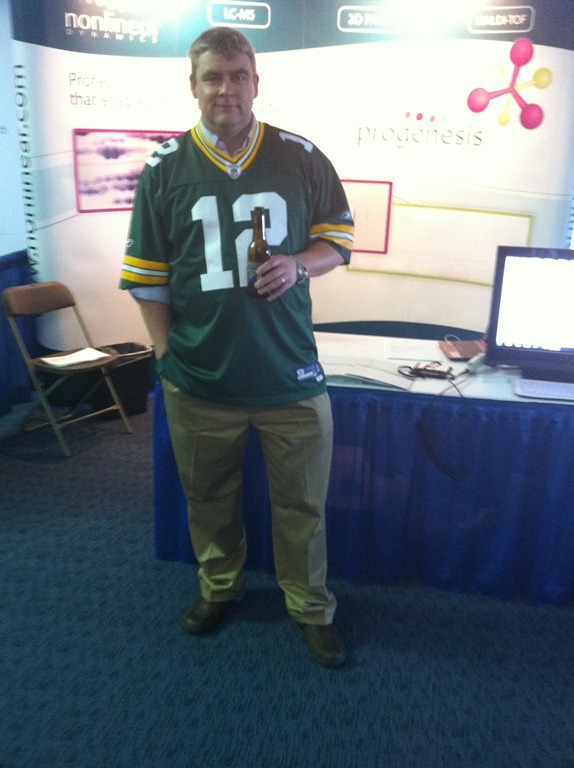 « Is Progenesis LC-MS Investigator the answer to your analysis bottleneck? MSACL (Mass Spectrometry Applications to the Clinical Laboratory) annual meeting in San Diego is the first conference of 2011 for the US team. It is the start of a busy couple of months of conferences as we are also attending ABRF and US HUPO. The latter is being held in Durham, NC, this year so a stone’s throw from our US office – very convenient! As with most conferences, MSACL kicked off at the weekend. But this wasn’t any ordinary weekend, it was the Super Bowl weekend! Being a Brit, who has lived in the US for 11 years, I have come to support the sport of football – or should I say American football, not to be confused with the English football (soccer!) where you actually use your feet. So I was a little bit upset to be missing the Super Bowl party back home, but I have to say the organizers of MSACL did put on a great Super Bowl party of their own which was hosted in the exhibition tent. Two large projection screens meant I could man the Nonlinear booth, and still keep an eye on the game. Whilst a Green Bay jersey is not the official booth attire, I had to be able to show my support for Green Bay since I have followed them for a while. It was Jan 1998 since they last appeared in the Super Bowl so it was long overdue! After the game we all headed to the opening Plenary session, given by Prof. Francisco Villarreal. His talk was discussing the work he has been doing on Cacao Flavanol looking into the potential therapeutic effects of dark chocolate. A fascinating talk, but quite disappointing if you like chocolate as much as I do! The conclusion was that half a piece of dark chocolate is very good for you, but if you eat any more than that – all the benefits disappear I ask – who could just eat half a piece of chocolate and put the rest away for another day? Anyway the conference continues tomorrow, that’s all for now, over and out from San Diego! This entry was written by Mark Bennett, posted on February 7, 2011 at 5:20 pm, filed under February 2011 and tagged Conferences, Progenesis LC-MS. Bookmark the permalink. Follow any comments here with the RSS feed for this post. Post a comment or leave a trackback: Trackback URL.